This guide will explain how to import PDF file into a Word Document. For the purpose of this demonstration, you will require Adobe Acrobat Reader to be installed in your system. The software is available for free through Adobe. Place your cursor by clicking on the area where you wish to insert the PDF document. Click on Insert from the Ribbon. Under the Text group, click on Object. 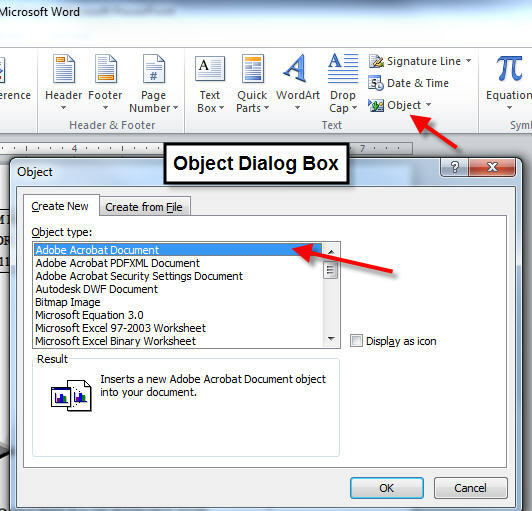 Under Object Type, select Adobe Acrobat Document and click OK.
A dialog box will open. Navigate to the folder to select a PDF file and click Open. The PDF file will now be imported into your Word document. Note, only the first page of the PDF file will be displayed. The image of the PDF links to the actual PDF file. If your file contains multiple pages, the user can double click on the PDF file and open the actual PDF document through Acrobat. The PDF file will be embedded into the Word document. You will notice that the Word document will have the file size increased by how large the PDF file is. It is a good idea to reduce the PDF file size before importing it into a Word document to reduce the final file size. This makes sharing the file easy with email and other means.